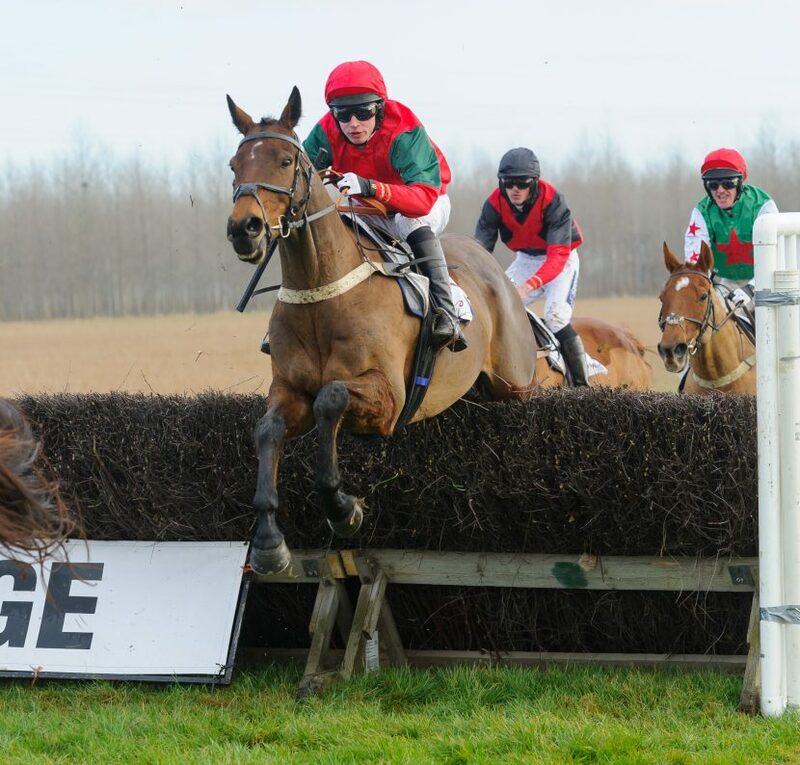 L’Eldorado, or “Bunny” as he is known to his friends ran a magnificent race on his seasonal debut at Thorpe Lodge on Sunday. Given a fine and intelligent ride by Tom Chatfeild-Roberts he settled well, just behind the leader Teeton Power before sweeping into the lead approaching the second last. Having jumped superbly all the way round, he got in a little tight to the last fence and lost a bit of momentum. For me watching, the run-in seemed to go on for ever ! but he bravely stuck his neck out and held on to cross the line 1/2 a length in front of former useful handicapper Denali Highway with the promising young mare Teeton Power running on again for 3rd. It was the 9th career victory for Bunny who is now 12 years young. He has been at North Lodge for 11 years, since arriving from France as a Yearling and is very much a favourite. Promising youngster Thomas Patrick finished in the frame for the second time on only his third career start when a close (6 lengths) 3rd in the concluding 10th race on the card at Thorpe. Like Bunny he was beautifully and sympathetically ridden by Tom Chatfeild-Roberts who had him in a handy position just behind the leaders for much of the race. Going to the second last He was in with a chance but found the weight concession of 14 lbs to the 4 year old The Flame (Tommie O’Brien) just too much and was pipped for 2nd on the run-in by De Pilgrim. This was a very encouraging effort and “Pat” will improve enormously for the run, both mentally and physically. He is a big horse who will take time to reach his peak but he certainly looks to be heading the right way.